A2 Hosting is one of the most well reviewed web hosts in the industry. They have satisfied the needs of hundreds of thousands of website owners throughout the world by delivering tremendous value, top notch reliability, and customer support that is second to none. Among their most popular hosting options are their VPS hosting plans. 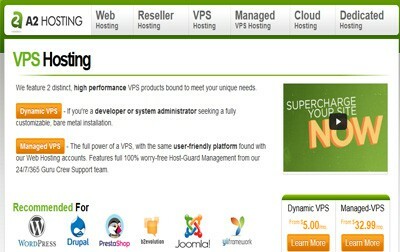 They have four different options for users to choose from, which include Entry, Mid, and Top from Dynamic VPS Hosting. Managed VPS Hosting includes Power+, Prestige+, and Pinnacle+. All options deliver a variety of solid technical features and ensure both speed and reliability of your websites. The Dynamic VPS plan is the most basic option that A2 Hosting offers and is therefore also the cheapest. Packages start at $5.00/month although you are able to customize your plan with several different add-ons if necessary. The Managed plans are much more expensive but also provide more advanced technical features to users. The Power+ plan starts at $32.99/month, the Prestige+ plan is priced from $46.19/month, and the Pinnacle+ option has a monthly price tag that starts at $65.99/month. Just as with the Dynamic VPS plan, all three of the Managed packages have customizable options that are offered at an additional cost. Yes. While they may be a bit more expensive than many other web hosts in the industry, one of the main perks of going with A2 Hosting is that they offer an Anytime money back guarantee. For full refund you must cancel your account within your first 30 days. The Dynamic plan is pretty basic in terms of technical features, although you are able to choose the amount of disk space, bandwidth, and memory that you want for your plan. Disk space options start at 20GB and allow you to go up to 50GB. Bandwidth is 2TB while you have the ability to choose between 512MB and 1000GB for memory. As for the Managed VPS plans, the Power+ plan features 4GB of RAM, 75GB of RAID-10 storage, and allows up to 2000GB of data transfer. The Prestige+ plan includes 6GB of RAM, 100GB of RAID-10 storage, and up to 3000GB of data transfer. The more advanced Pinnacle+ plan has 8GB of RAM, 150GB of RAID-10 storage, and up to 4000GB of data transfer. All four plans also give the option to add-on their Turbo Package that provides up to 20x faster page loads, speed enhanced Apache-compatible replacement, and a turbo cache option. Yes. All VPS hosting plans that A2 Hosting offers give you the ability to choose between three different server locations. A2 has one data center located in Michigan, one in Amsterdam, and one in Singapore. The Dynamic VPS hosting plan provides one free IP address to users while all three of the Managed VPS options include two IP addresses. With the Managed plans, you also have the ability to purchase up to five additional IP addresses. Are SSL Certificates Included With Each Plan? No. Unfortunately you are required to purchase an SSL certificate for all four plans. If you do not already have one, you can get one directly through A2 Hosting for $4.16/month. What are the Disadvantages of Each Plan? All of A2 Hosting’s plans have the same problem; there are too many add-ons and not enough initial features. While this does allow you to completely customize your plan to meet your unique needs, it also opens up a can of worms when it comes to making decisions about what you need. The additional costs can certainly pile up as well. No. Only the Dynamic VPS hosting plan offers full access root access to users. The three Managed VPS plans do not allow full root access although there are a few options through cPanel that allow you to give controlled access to other users. Yes. 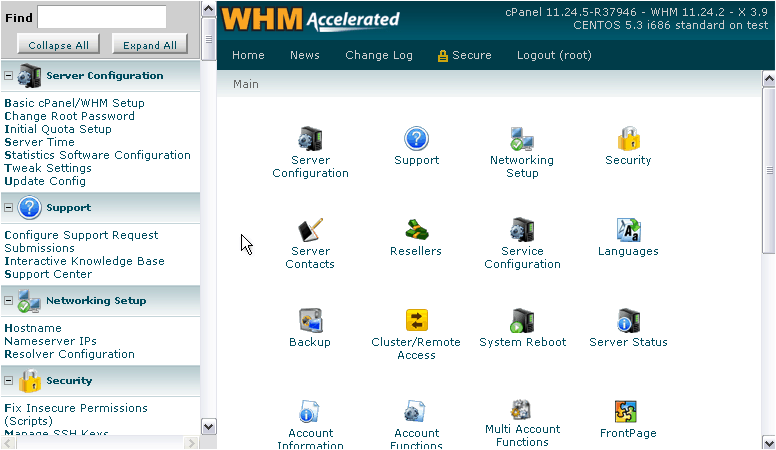 All four plans utilize cPanel as the control panel. You are, however, required to pay an additional $10 fee for WHM access. 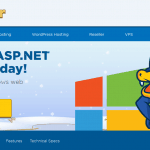 Does A2 Hosting Use Linux or Windows Servers? Linux. All of the VPS hosting plans use Linux as their servers. Linux is known to provide more customizable options and better security than Windows does. It should be noted that you have the ability with the Dynamic plan to choose the type of server and processor that you would like to use. A2 Hosting is known throughout the industry for their ability to consistently provide top notch customer support for all of their plans. They provide 24/7/365 assistance through live chat, phone, and ticket support and have a vast knowledgebase where you can easily search for self-help oriented articles and tutorials. If you would like to receive premium support with your VPS hosting plan, you have the ability to do so although you will have to pay an additional $20/month. While this may seem like a hefty price tag, having dedicated experts available at anytime can be a lifesaver when technical issues take place. Are Free Website Transfers Included? All three of the Managed VPS hosting plans include one free website transfer. Unfortunately you will have to pay for a website transfer if you intend on going with the Dynamic plan. You will also have to pay additional costs if you want to transfer more than one website with the Managed plans. Are Solid-State Drives Included With Each Plan? The Dynamic VPS hosting plan allows you to choose whether or not you want to utilize a solid state drive while the Managed VPS hosting plans all have SSDs included with them. Do Plans Include Host Guard? Unfortunately the Dynamic plan does not include Host Guard although all three of the Managed packages have Host Guard pre-installed. This makes for 100% worry-free hosting as it allows for increased security and reliability of your servers. At the end of the day, A2 Hosting is a great option for users that know exactly what they want and are intrigued by the opportunity to customize their plan to meet their needs. While it is certainly not the cheapest web host out there, the hardware features, reliability of their servers, and top notch customer support all combine to make their VPS hosting plans a solid option. When choosing between the three plans, the most important choice you will need to make is whether to go with Dynamic or Managed VPS. For the most part, this decision will come down to whether or not you need full root access and how much customization you want with your package. Price can also be a factor here. Be sure to get in touch with A2 Hosting’s dedicated support staff for help determining the plan that is best for your unique situation. Provides a wide range of customization options that suits clients needs and with advance features for mor advance users. Allows anytime money back guarantee to user so you can try them risk-free. Not the cheapest.